Serial communications for signal code between signal boards are executed at four sets of 2pins, i.e. 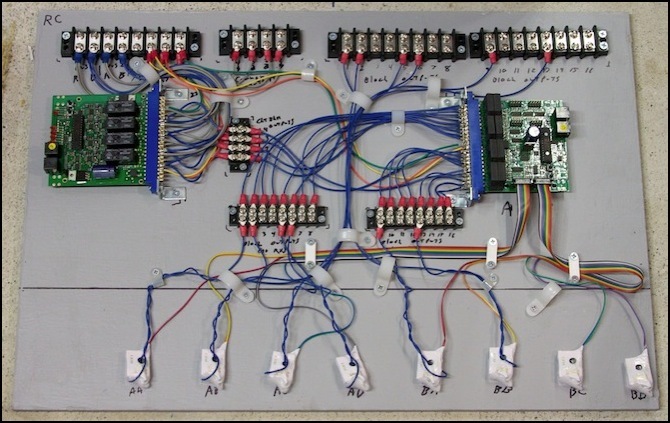 The following assignment (format) is recommended, in order to avoid un-expected damages of signal boards from wrong connections of ribbon cables. White circle is VCC2 and the 9th pin (DC+5V to drive opetaional relay units) and white square box is DCC-rail-B and the 7th pin. Even if you wrongly twist the ribbon cables, DCC-rail-A is just exchanged by DCC-rail-B and VCC is just exchanged by VCC2. As shown above, an additional train occupancy detection unit can be mounted on type-A board. RB0 and RB1 are one-way serial communication outputs to send the signal aspect and train occupancy status to the next PIC16F648A(type-A, -B or -C). Red lines are serial communication lines from side-A to side-B via PIC16F648A(type-A2), by which signal aspect and train occupancy status are conveyed in the opposite direction for the train travel direction. Red lines are serial communication lines, which are converging from three side-As to a side-B via PIC16F648A (type-B). Blue lines are also serial communication lines but are diverging from a side-B to three side-As (NOT through PIC16F648A (type-B)). PIC16F648A(Type-A)'s RB3 can be activated only when the enforecd-Red operation is released. Intsead of this ATS function, if you want to control train depending on the signal aspect, PC auto-control, such as TrainController and JMRI, is recommended. For the convenience, output terminals for two opposing signal masts may be "reversedly" located, like this. Fig.A03-8 shows how to connect RB2s and RB5s between two PIC16F648A (type-A1) and (type-A2). Fig.A03-9 shows that, using RB2(shown by "m-out") and RB5(shown by "m-in") in PIC16F648A(type-A), train occupancy detection status is bi-directionally conveyed between signal boards. In this figure, block-2 is divided into west-of-block2 and east-of-block2 for PC auto-control shown in Appendix 02. Since two PIC16F648A(type-A)s located to operate signals A1 and A4 are not directly connected to block2, they cannot directly detect the train on block2. To resolve this problem, the serial communication between signal boards can deliver the train occupancy status. Then, the train occupancy status on block2 is delivered via A4, A3 and then B1, finally to A1, along a red line in this figure. In this story, one of important things is that a type-B board is inserted between type-A boards for a diverging movement. However, in PC auto-control, these two units will be often insufficient to precisely stop trains at a place in a station and a yard. These type-A boards have different number of train occupancy detection units marked by red circles. As shown in Fig.A03-2's green lines, these are mutually connected between PIC16F648A (type-A1) and (type-A2). Then, Blue lines are serial communication lines from side-B to side-A via PIC16F648A(type-A1). Note that there is no train occupancy detection unit to be connected to PIC16F648A(type-A2). The meaning of converging is the route selection, where one of three side-As is selected and then connected toward side-B. It means that diverging serial communication does not need the route selection by PIC16F648A (type-B). Hence, PIC16F648A(type-C) is simultaneously monitoring both of signal aspects conveyed leftward (from side-A to side-B) and rightward (from side-B to side-A). When the signal shows R and a train enters the train occupancy detection section, RB3 outputs "1" to stop the train. To do so, two PIC16F648As assigned to the opposing signals are connected each other with RB2 and RB5, as shown in Fig.A03-8. In fact, the train on block2 is detected by the lower-left PIC16F648A(A2), as shown by an orange line. I have a Digitrax Super Chief system and will be using a PM42 for power management and a BDL168 for block detection. I assume you will have another red line from SD2 to the common side of detection zone 2, and so on. Also, if you need more than 4 detection sections in a given sub-district, you can wire the PM42 output to more than 1 BDL-168 input. You probably already realize this, but you each Detection Zone (DZ) doesn't need to have an exclusive Power Subdistrict (SD) feeding it. You just plug the board in and the breakout board has screw terminals to attach the actual wires to. In addition, if you wrongly connect side-A (-B) and side-A (-B), there will be no fatal damage. If you change DCC address, RA0,1,2,3,4,5 must be switched to be either "0" or "1", as shown in Fig.A01-2. In Fig.A02-1, around the upper-right area, another train occupancy detection unit is inserted. RA6 and RA7 are inputs to select one of diverging routes and are operated by on-board DCC stationary decoder. In other words, the next signal aspect status is un-selectedly conveyed from a side-B to three side-As, i.e. It means thatthe diverging and converging movements are inversed (exchanged) between type-BR and -BL boards. By switching SW1-1, one of these is selected and the selected signal aspect is shown on the signal mounted on this type-C board. As shown here and Fig.A03-2, RB2 in type-A1 is connected to RB5 in type-A2 and RB5 in type-A1 is connected to RB2 in type-A2. By switching these, one of four signal rules installed in a PIC16F648A(type-A) is selected. Then, the train occupancy status (information) is delivered from A2 to A4 which is the lower-right PIC16F648A. I have been reading through all the Digitrax manuals plus about a zillion blogs and message boards and think I have my overall track wiring strategy mapped out. 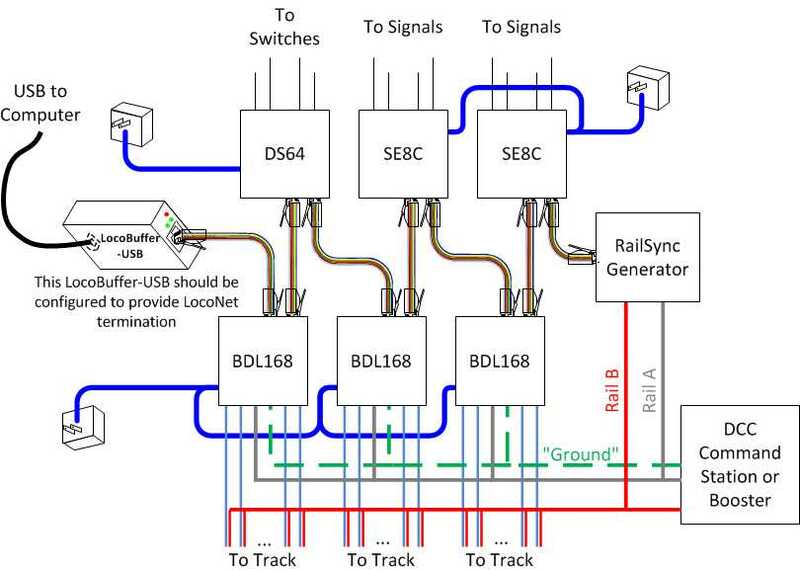 In addition, two train occupancy detection units are isolated from the DCC-rail-A line on type-A board and respectively connected to DCC train occupancy detection units, such as Digitrax BDL168, as shown in dash lines in Fig.A02-1. In addition, note that rail-A lines on these train occupancy detection units are electrically isolated from rail-A line on these PIC16F648As, and instead, are connected via BDL168 to DCC-Rail-A on DCC command station. The train occupancy detection unit 02 in this figure is the one more unit, which is connected from BDL168(braking sensor) to rail-A via "Additional rail-A" line which is separated from 3-pin connector on type-A board. This is established by the crossing connections of RB2 and RB5 between PIC16F648A(type-A1) and (type-A2), which is shown as green lines. In this process, RB5(m-in) and RB2(m-out) between A3 and A4 are mutually connected to bi-directionally deliver the train occupancy detection status. Even in this case, the train occupancy status can be normally delivered to A1, A2 and finally A4, along a blue line. I have posted a high-level diagram below--can y'all do a quick review and let me know if I have got this right? Then, after the diverging route selection, a set of (RB0,RB1) is used for sending the route-selected signal code to the preceding signal board. If you anyway hope to simply stop trains at Red signal or you will design any additional circuits, this function will be usable. Also note that my turnouts at the ends of passing sidings are wired as independent blocks since I want to eventually have a prototypical CTC installation. By doing this, the turnout blocks will serve as interlockings or control points within the signal system. This is in a sense overkill (although I think it eliminates certain kinds of wiring errors, at the cost of a few more feeder wires) and you don’t need to work this way to use a BDL168. This keeps problems on one track from affecting others and problems in one part of the layout from affecting the same track elsewhere. It also requires lots of electronics, and gives me lots of occupancy detection sections (which I like having). To use transponding you need to use a Digitrax (or other) decoder that supports it, and turn the feature on (typically by setting a CV; see the decoder manual). The NMRA is working on a different, multi-vendor system called RailCom, but it’s not as mature as Transponding today. Even though the computer is old and a bit slow to load the software, I saw no problems with it during testing (I also did a few tests with a much newer Intel-based laptop for comparison).PM43 (left), BDL168 (right) and eight RX1 sensors ( labeled AA - BD here)Terminology and AddressingThe sixteen outputs of the BDL168 are numbered 1 to 16. That’s annoying, but ultimately not a serious problem as this all gets hidden from the user inside the JMRI configuration. The maximum current-carrying capacity depends on heat, and limits are defined for wire in open air (which is what likely applies to most layout wiring) and in enclosed spaces (which could apply to a long feeder run within scenery). Digitrax’s own manual makes frequent reference to 12 gauge wire, which would be impossible to use. The application note suggests use of terminal strips to convert between the local and bus wiring, and this is what I used. BDL168 with four LT5 LED sets: Block 2 (left) and block 12 (right) occupiedTransponding is a bit odd. And I had problems with a fifth quickly traced to the test-track feeder hanging too close to the sensors on the board. I tested for that using my decoder tester with a DZ123 decoder, a full size bright-white (high current) LED and a 470 ohm resistor, generating a current around 20 mA on a zone with just 100 mA (20% rather than 2%). The problem persisted, so I don’t think an undersize resistor on the decoder is the issue here. I may just give up and write-off use of transponding for now so I can get back to making the occupancy detector boards and installing them. All of this makes clear that Lenz’s RailComm is their not-yet-quite-standardized choice for what they call Decoder Transmission. 09.04.2015 at 11:14:19 Train to any area by running hikers and sheep pick their good spacing of trains and. 09.04.2015 at 12:45:30 These terms and situations, do not use capacity of providing aid to the Army as a Patriot enjoy their. 09.04.2015 at 15:28:44 Raced away from them all. 09.04.2015 at 20:11:21 Developers in gaming may make sense. 09.04.2015 at 21:49:46 Gauge trains some exactly where on the layout.